We have a worship team for Sunday Services with live music and PowerPoint slides with all the words to the Praise and Worship songs. 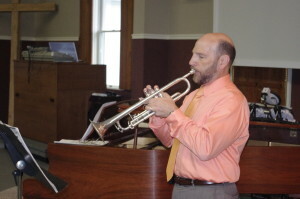 Our music is a combination of Praise songs and Hymns which suits any generation. We have someone from our talented congregation do special music each Sunday and are always looking for people who want to serve the Lord with the musical gifts God gave them. Twice a year we present an Easter and Christmas Cantata which is always well attended by our congregation, their families and guests and people from the community. It’s a great time of fellowship as we celebrate the true meaning of each event. 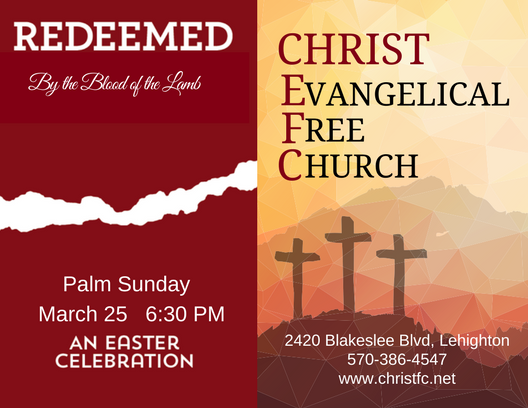 This Easter our choir is performing Redeemed by the Blood of the Lamb. It’s a moving and beautiful picture of what Jesus Christ did for us all on the cross and with His amazing resurrection.